’Twas the night before—X-Mas? Winter Festival? December Holidays? Festivus? As Canadian society moves in an increasingly secular direction, public disagreement over what to call the season becomes more common. But even when we retain the historic title Christmas, the average person’s thoughts run along the lines of Santa Claus, family dinners, taking time off work, and gift-giving (or getting). The birth of Jesus, if remembered at all, is at best an afterthought. While perhaps the third most important day in the Christian calendar (after Good Friday and Easter), it appears Christmas has lost much of its religious significance for the world around us. The concern about using Christmas as an opportunity for evangelism has been part of the celebration since its beginning. Truth be told, Christmas is a somewhat late addition to the Christian calendar. For the first few centuries in the Church, the birth of Christ was not an official holy day. Some early theologians like Origin of Alexandria and Arnobious of Sicca condemned the celebration of birthdays in general and divine birthdays in specific. However others, such as Clement of Alexandria and Hippolytus of Rome, thought the Incarnation should be celebrated and so began attempts to determine the precise date of Christ’s birth. A number of dates were suggested, but in 336 A.D. the Church set Christmas Day officially as December 25. Today, scholars disagree over whether the Church truly thought December 25 marked the birth date of Christ; whether it was trying to displace a pagan Winter Solstice festival in honour of the Sun the same day; or whether both were elements in their decision. Regardless, the fact that the pagan and Christian celebrations coincided became an opportunity for the Church to reach out to non-believers. The Romans were used to worshipping the sun on December 25. Now, Christians invited them to worship the Son. 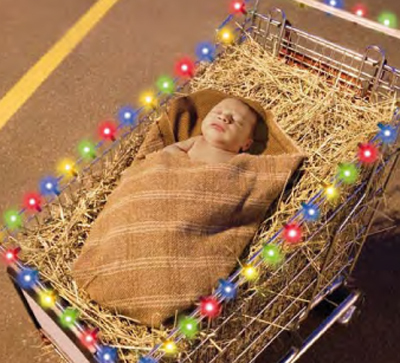 By joining “Christmas” with “The Nativity of our Lord,” Christians can remind the world around them there is a deeper meaning to “Christmas” than they generally remember. Today, gift-giving is undoubtedly the primary meaning of Christmas among non-Christians. The changing meaning of “Christmas” is not a new problem. The popular Christian author C.S. Lewis, writing half a century ago, noted that even in his time Christmas had come to mean a number of different things. There was still the religious meaning for practicing Christians, but he also highlighted an additional, deviant meaning gaining ground: Christmas as a commercial event. Lewis warned that people were forgetting the religious significance of the day in the midst of the hustle and bustle of gift-giving and receiving. Previously, he reminds us, “the interchange of presents was a very small ingredient in the older English festivity.” By contrast, his contemporaries seemed to think gift-giving was all that Christmas entailed. Exasperated with the “very commercialized and vulgar fuss,” he would eventually remove himself from the entire process: “I send no cards,” he writes to an American friend, “and give no presents except to children.” While most Lutherans today would likely take a less reactionary position, it is hard to argue with Lewis’ criticisms. Today, gift-giving is undoubtedly the primary meaning of Christmas among non-Christians. For Veith, that unbelievers participate in gift-giving at Christmas is a foretaste of things to come. Scripture teaches that some day, “at the name of Jesus every knee [will] bow, in heaven and on earth and under the earth, and every tongue confess that Jesus Christ is Lord, to the glory of God the Father” (Phil. 2:10-11). “During the Christmas season,” Veith writes, “practically the whole world celebrates the coming of Jesus Christ, including those who do not believe in Him.” Christmas remains a fundamentally Christian event even if many of those participating do not recognize it now. A number of Lutheran Church–Canada’s people apparently feel the same way, according to responses received on line. For them, Christmas is about Christ whether the world recognizes it or not. As long as the Church “knows what Christmas is about,” writes one, “why change the name?” For her and others, changing the name for the birth of Christ to “The Nativity of our Lord” would be the same as admitting defeat in the cultural war currently raging over Christmas. It’s a war that has raged for some time—much earlier than us, much earlier than C.S. Lewis. Centuries ago, English Puritans argued that the religious significance of the holiday had been sacrificed for drunken revelry. In fact, when England came under the control of the Puritan Oliver Cromwell in the 17th century, he banned all Christmas celebrations. Drunkenness and gluttony would have no part in the religious observations. The people were instead ordered to hold somber fasts. Feasting and decorating became legal offenses; in the city of London at least, soldiers took to the streets to enforce the ban. Few today would suggest Christians go so far. The birth of Christ is, after all, a joyous event, and wanting to celebrate it with family and friends is both natural and good. That said, the Puritans still remind us of one thing: Christmas is, at its core, not about feasting. It is not merely an occasion for a family get-together. And as Lewis reminded us, it is not about people giving each other gifts for the sake of giving gifts. Instead, it is about Christ. It is about celebrating the mystery of the Incarnation: God becoming man. And while we rejoice over that event, we do so in the knowledge that Christmas is but a precursor—a precursor to the sorrow of Good Friday, the joy of Easter morning and to our salvation. Whatever we call our celebration of Christ’s birth this year, let that be our constant prayer for the world around us. I must have missed that particular FB conversation. I don’t see it on the LCC page. Where is it? No church is actually changing the name of “Christmas” *to* “The Nativity of Our Lord.” The latter is not a new name for the season. Both terms are right in our hymnal, and part of historic church usage. Properly understood, both point to Christ: the first emphasizes the Word made flesh and the accompanying Divine Service; the second specifies that it is referring to the birth of our Lord. We should not denigrate the first term for being too secular, or cast aspersions on the second for being too “complicated” or “non-seeker-friendly.” I also have great reservations about the theory of Christmas being intended, from the very beginning, to be any sort of evangelism tool. It was posted October 19 for about a month, when we had to take it down and use the answers we received for the article. As for Christmas and evangelism, can you think of any other time in the church year when the church service includes non-members and perhaps non-believers? I can think of lots of times when the church service includes non-members or perhaps unbelievers, but I’m not saying that Christmas isn’t a great time to invite people to church. I’m saying that Christmas, and the other major festivals of the church year and the Divine Service in general, weren’t deliberately orchestrated as outreach tools. Clearly, we celebrate Christmas because it gives us a remembrance of the sign that God gave us through the birth of Jesus. We celebrate that God gave us this sign. Who ever supports the christian faith agrees in the sign that God gave to all men. The sign is found in Luke 2:12. Merry Christmas to all my brothers and Sisters in Christ.